The biggest news to come out of the 17th Party Congress in 2007 was the selection of Xi Jinping---then Shanghai Party Boss--- and Li Keqiang---then Liaoning Party Boss---as members of the all-powerful Standing Committee. Both men were in their early 50s at the time and were widely seen as possible successors to Hu Jintao. Xi emerged as the favorite in part because he was introduced first and was given a slightly higher rank but the overall message seemed to be that the two men were relatively equal and would fight to be leader over the next five years with the winner being the one who performs the best. Many think that Xi was given a higher ranking because he is more highly regarded among the Communist party elite. By late 2009 Xi Jinping was seen as the favorite to be the next leader of China. Both Xi and Li are seen as ‘safe choices’ who will not deviate from the political line laid down by patriarch Deng Xiaoping, ex-president Jiang Zemin and President Hu. Fenby of The Guardian wrote: As president-in-waiting, Xi has visited Australia, Germany, Japan and the Americas. According to people who met him on these trips, he was polished, interested in what he was shown and generally affable. However, in Mexico last year, he lashed out at "a few foreigners, with full bellies, who have nothing better to do than try to point fingers at our country” China does not export revolution, hunger or poverty; nor does China cause you any headaches. What else do you want?" Hints of Xi Jinping’s Policies? Tania Branigan wrote in The Guardian: But while Xi is well-liked and adept at glad-handing, he appears to give little of importance away. Even his popular wife has retreated into the background as he has assumed increasing prominence. The US ambassador Gary Locke recently observed that he was "very personable" but that US officials "really don't know that much about him". Xi's networks are unusually broad, according to Brown: "Provincially; through his family; and with the military through Geng Biao. His elevation is in the interests of the widest group of people and opposed by the smallest group." It is the same relatively small elite who will determine what he can do with the job. Some think Xi's networks may allow him to strike out more confidently than Hu. Others think he will struggle to win support for bold decisions needed to tackle the country's mounting challenges. "I think he's a more instinctive and gut-driven politician and may surprise us. Others say the system and the vested interests around him are too strong," said Brown. Some hope he shares his father's liberal sympathies: Xi senior was not only a noted economic reformer, but an ally of reformist leader Hu Yaobang. Some say he criticised the military crackdown on Tiananmen Square's pro-democracy protests in 1989. They say that grassroots organisations burgeoned during the vice-president's stint in Zhejiang, and there was progress in the election of independent candidates at local polls. But the Chinese Human Rights Defenders network has argued the province also saw "zealous persecution" of dissidents, underground Christians and activists: "His track record does not bode well," it wrote. Other China watchers point to shattered hopes that Hu might prove politically liberal. Nor does Xi's confidence in overseas dealings necessarily indicate a more emollient approach to foreign relations. His most-quoted remark to date was made on a trip to Mexico in 2009: "There are some well-fed foreigners who have nothing better to do than point fingers at our affairs. China does not, first, export revolution; second, export poverty and hunger; third, cause troubles for you. What else is there to say?" "Personal misfortunes?" That stunned me. Xi isn't any more like Mandela than Adolf Hitler is like Franklin Delano Roosevelt. Mandela spent 27 years in a dark prison for the cause of freedom and human rights. Those are Mandela's "personal misfortunes." After getting out of jail, in the spirit of forgiveness and benevolence, he transformed South Africa's society into one where different ethnicities could settle their differences. He was a man worthy of the honor of the Nobel Peace Prize. Xi, the offspring of a high leader who temporarily fell from power, was engulfed by one of Mao's political campaigns and sent to a poor village in western China. Xi has never publicly questioned or criticized that period. He said that period of "eating bitterness" only increased his loyalty to the Communist Party. People say Hu and Xi belong to different political factions. They say Hu comes from the Communist Youth League and is therefore more populist, whereas Xi, because he represents the "princelings" -- sons and daughters of high officials -- works in service of the wealthier coastal provinces. I think they're not that dissimilar. No matter if it's Hu or Xi, they're still only representative of the few-hundred families who make up the Chinese aristocracy. They are not in office thanks to a Western-style election, but are the products of a black-box operation. They didn't rise because they're clever and capable, but precisely because they're mediocre. They are where they are today because they are harmless to the special interest groups that run China. Like Hu, if Xi has any special ability, it's his ability to balance himself on a steel wire. Xi served in Hubei, Fujian, Zhejiang, and Shanghai, among other places. Nowhere does he have any political accomplishments worth praising, or any offenses worth condemning. No one knows his real thoughts: He hides them even deeper than Hu did before he became chairman. Unlike Bo Xilai, a fellow princeling who has been conducting Mao-style politics in Chongqing, the city that he runs, Xi has no edges or corners. Xi's family background appeases China's senior statesmen: He's "their man." Xi was in the army; the military and other powerful departments all support him. Xi's father was a liberal, so the groups with reformist aspirations preserve that fantasy in their hearts. In today's China, where vested interests have solidified like concrete, at most Xi is the country's "chief maintenance officer." As the Communist Party's crisis of rule grows more serious by the day, China needs a charismatic and farsighted leader. Xi is neither. The party's talent-selection mechanism has already rotted -- they're no longer able to produce people like Zhao Ziyang or Hu Yaobang, the type of excellent leaders China had in the 1980s (both were deposed by former leader Deng Xiaoping because they wanted to change the system). They say Xi will rule us for a decade, but can this outwardly strong but inwardly weak regime maintain itself for another 10 years. Economic development cannot continue at this same speed. When Hu passes the power to Xi, he will finally be able to breathe a big sigh of relief knowing that he won't be the last king of a dynasty. Will Xi be able to say the same? The new official party history skirts details of the saga and blames Xi’s downfall mostly on the machinations of Mao’s security chief, Kang Sheng. Branding Xi and others as members of “an anti-Party clique” was “totally wrong,” the history says. Xi was finally rehabilitated after Mao’s death. The Chinese vice president, however, demonstrated some strongly held convictions in his remarkable talk to the students at Qingchengshan High School. "The world is yours and it is also ours; but ultimately, the world belongs to you," he said, "Young people are like the sun at eight or nine in the morning. The future rests with you." Xi was repeating verbatim what Chairman Mao told a group of Chinese students at Moscow University when he visited the Soviet Union in 1957. While there is no evidence to suggest that Xi deliberately used Mao's famous Moscow speech to embarrass his guest, there is little doubt that China's Fifth Generation leader is an ardent believer in many aspects of Maoism. Together with another high-profile princeling, Chongqing Party Secretary Bo Xilai, Xi has been responsible for a far-reaching restitution of Maoist norms in the past two years. For example, at a seminal address to students at the CCP Central Party School earlier this year, Xi urged students to "pay attention to the Marxist canon," especially Mao's classics. "Cadres must seriously study Marxist theory to ensure that they can maintain political resoluteness," he said. Xi added that since Marxist classics were voluminous, "we should focus on the salient points, and concentrate on studying the quintessence--particularly the important works of Mao Zedong." Vice President Xi has never gone on the record on whether he shares Mao's hard-line policies toward the U.S. Yet he has spoken highly of such Maoist dictums as pingzhan heyi, or "the synthesis of [the needs of] peacetime and war." This means a more extensive program of training reservists and that civilian resources and facilities should be used for military purposes in times of war. Moreover, it is significant that the PLA being an important power base of the supremo-in-waiting, Xi has lent his support to the no-holds-barred modernization of military hardware. Indeed, a good part of the confidence with which Xi has impressed the Biden delegation may have sprung from the fact that the vice president's fellow princelings have become arguably the largest faction within the military establishment, compared to, for instance, officers who still profess allegiance to President Hu. Rights groups have been watching Xi’s trip to Tibet closely for signs of how policy toward the region may change. “Very little is known about [Xi’s] opinions on Tibet, except that his father, Xi Zhongxun, who was a former Chinese vice premier, was close to the 10th Panchen Lama and also knew the Dalai Lama,” said Alison Reynolds of the International Tibet Network. Xi Jinping, a Supporter of the Singapore Model for China? Part of Xi's confidence and sophistication has emerged through having a better grasp on world affairs, especially China-U.S. relations. The Chinese Vice President indicated both countries should "ceaselessly boost Sino-American strategic mutual trust." Xi continued "Both sides should objectively and rationally look at each other's development and make correct judgments on the each other's strategic intentions." Even more significant is that fact that Xi appeared to give a vote of confidence to the American economy. "The U.S. economy is highly resilient and has a strong capacity to repair itself," he said in a forum of Chinese and American businessmen. "We believe that the U.S. economy will achieve even better development as it rises to challenges" This was in sharp contrast to the scores of commentaries in the official Chinese media that expressed a lack of confidence in the Barack Obama administration's ability to pull the U.S. out of the current debt and financial crises. Tell-tale signals, however, seem to betray Xi's less-than-enthusiastic proclivities toward the United States. Before Biden's arrival in Chengdu, capital of Sichuan Province, a dozen-odd dissidents were either detained briefly or given severe warnings not to try to present any petitions to the American VIP. Xi was nowhere to be found during Biden's speech at Sichuan University in which the veteran U.S. politician made a pitch for "openness, free exchange of ideas, free enterprise and liberty". Xi did accompany Biden to Qingchengshan High School, which had been newly reconstructed after the horrendous 2008 Sichuan Earthquake. However, while Biden engaged in a spirited pep talk with the students, Xi, who was sitting nearby, did not seem to be paying much attention to his guest. He frequently was looking in a different direction and appeared to be either bored or lost in thought. "My impression of the country came from you. For me, you are America," he told the people who had hosted him in 1985. He recalled telling the daughter of his hosts, the Dvorchaks, about the Hollywood films he enjoyed, including "The Godfather", reported the China News Service. "She was astonished and wondered how we could have seen so many American movies," recalled Xi. "Although I stayed with the Dvorchaks for only two nights, they were two nights when I directly connected with the American people," he said. "That's something I'll never forget as long as I live." But despite the shows of bonhomie and China's effusive media coverage, Xi's visit was punctuated by flashes of the tensions. Obama, Biden and senior members of the U.S. Congress plied Xi with demands that Beijing do more to balance trade, help the United States deal with global troublespots, and relax its heavy grip on dissidents and restive Tibet. Republican presidential candidate Mitt Romney publicly blasted Obama's China policy and called the Democratic president's meetings with Xi "empty pomp and ceremony." It was a reminder that domestic crosscurrents on both sides of the Pacific can complicate attempts to stabilize Sino-American ties. For his part, Xi mixed his vows of goodwill with reminders that China is impatient with U.S. arms sales to Taiwan - the self-ruled island that Beijing deems an illegitimate breakaway - and with Western sympathy for Tibetan resistance to Chinese control. "History demonstrates that whenever each side deals relatively well with the issues bearing on the other side's core and major interests, then Sino-U.S. relations are quite smooth and stable. But when it is the contrary, there are incessant troubles," he said in his main speech in Washington. In his public comments, Xi has avoided hitting back at the Obama administration's complaints about the U.S. trade deficit and Beijing's strictures on political dissent. China's state-run media have cast his visit as a triumph of goodwill, and largely avoided reporting the barbs from Washington. Carla Hills, a former U.S. trade representative, who met Xi in Washington, told Reuters, "I think it's very tough to develop trust and willingness to cooperate unless you know the people on the other side and have confidence in them," said Hills. "I sat next him at the luncheon. I think anyone who had tagged along behind him invisibly would have to say he did what he came to do. And that was to introduce himself." Xi started his fourth day in the United States at a downtown Los Angeles trade conference hosted by the Chinese Ministry of Commerce. His American counterpart, Vice President Joe Biden, joined him later. California Gov. Jerry Brown and Los Angeles Mayor Antonio Villaraigosa both lauded the U.S.-China relationship. "We've got a great future together," said Brown, who announced plans to open a new trade and investment office in China. China is a major trade partner with Los Angeles, which has greatly benefited from its Pacific Rim position and has courted Chinese businesses and their potential jobs. The New York Times reported that business deals were announced, including one between Chinese companies and DreamWorks Animation, the American film company. In the afternoon in Xi was led on a tour of the Walt Disney Concert Hall, designed by Frank Gehry, by Mr. Gehry himself. Xi wrapped up his visit at Staples Center, where he attended a Los Angeles Lakers-Phoenix Suns basketball game Friday night. Following the Lakers 111-99 victory, Xi and his party left for the airport. A day earlier, Xi toured the Port of Los Angeles, the nation's busiest port complex. Nearly 60 percent of the imports moving through the port come from China.Chinese imports have helped Americans improve their standard of living and created more than 3 million new jobs in the U.S. from 2001 to 2010, Xi said.U.S.-China trade is expected to top $500 billion soon, and the countries have moved from "mutual estrangement to a close exchange with increasingly intertwined interests," he said. Outside the hotel hosting the trade forum, picketers protested Chinese policies in Tibet and its treatment of Falun Gong followers. Two protesters were cited for standing in the roadway but no one was arrested, Los Angeles Police spokesman Cleon Joseph said. After the trade forum, Xi and Biden visited a suburban school in South Gate that specializes in Asian studies to promote more American students studying in China. The vice presidents watched a traditional Chinese "dragon dance" performed by middle- and high-school students at the International Studies Learning Center, a public school that is part of the Asia Society's network of schools across the country. Biden told the students that the U.S.-China relationship is the single most important relationship the country has in the 21st century. Xi, who spoke with a class of high school students learning Chinese, lauded their Mandarin skills, saying it was important to learn the culture as well as the language to avoid misunderstandings. 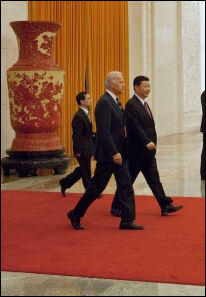 Biden said he appreciated Xi's candor. "He is very, very direct. When we disagree, there's a clear statement of disagreement," Biden said. "I was impressed by how much he wants to know about how our system works." Xi was accompanied to the NBA game by Brown and Los Angeles Mayor Antonio Villaraigosa. In one photo op Xi was show standing with former NBA great Magic Johnson. 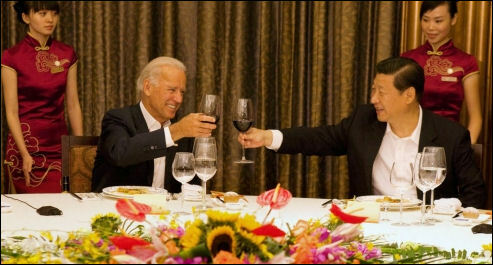 Mr. Biden said that Mr. Xi also seemed to want to learn everything he could about the American political system. In Los Angeles Xi seemed keen to tell the students about the connection he had made with Americans in his 1985 visit to Iowa. “That trip to the United States was the first trip I made to this country,” he said. “If anything, my trip back to Muscatine the other day reinforced my impressions of 27 years ago.” But Mr. Xi may be engaging in mythmaking. Nicholas Platt, a senior American diplomat, told the New York Times that Mr. Xi had visited Washington in 1980 as part of a delegation led by Geng Biao, a top Chinese general. 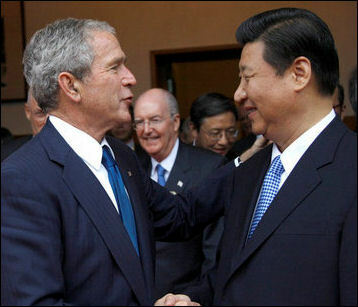 Mr. Xi was the general’s aide. “He wasn’t on protocol lists,” said Mr. Platt, who organized the general’s visit. “To the best of my knowledge, based on a reliable source, that was his first trip to the U.S.” Jin Zhong, a magazine editor in Hong Kong who has researched Mr. Xi, also said in an earlier interview that Mr. Xi had traveled with General Geng to Washington in 1980. Comments posted on the popular microblogging sites known as weibo—as good a barometer of real sentiment as exists in China—suggest that Xi has struck a chord by using the simple everyday language of most Chinese and sprinkling his speeches with common cultural references, including a line from a pop song and an advertising jingle. Xi seemed at ease around his American hosts, whether climbing into a tractor cab in Iowa or sitting tie-less during the fourth quarter of a Los Angeles Lakers game as he laughed alongside Mayor Antonio Villaraigosa. It’s not an image Chinese are used to after the decade-long presidency of the stiff and formal-looking Hu Jintao, who often comes across in photos as a typical Communist Party bureaucrat. And many here noted the difference. Of course, relatively few people here have been closely following Xi’s travels—New York Knicks star Jeremy Lin is a much bigger trending topic on weibo. But in the new era of microblogging and instant news, Xi is getting far more exposure than any other Chinese leader at this stage of the transition to power, and he appears comfortable in the spotlight. Many weibo users and Chinese media outlets expressed surprise when Xi, in his speech at the State Department, followed a remark about the lack of a precedent for building a cooperative U.S.-China partnership with a phrase from a song: “May I ask where the path is? It is where you take your first step.” The line came from a Chinese TV drama popular in the mid-1980s titled “Journey to the West,” also known as “The Monkey King Story” after the classical Chinese epic on which it was based. On the sensitive issue of human rights, Xi told U.S. lawmakers that in his talks with the White House, he ‘stressed that China has made tremendous and well-recognized achievements in the field of human rights over the past 30-plus years.” Then he added, “There is no best, only better,” borrowing the advertising line of an electronics chain here that has become a popular phrase, used in everyday life. Many Chinese also appeared to enjoy Xi’s account of how, in 1992, when he was a local party official in Fuzhou, in Fujian province, he helped an elderly American woman find the village of Guling, where the woman’s late husband had lived as a child but never had a chance to revisit. Some local TV and newspaper outlets ran pieces on Guling, including one paper that published the old People’s Daily photographs of Xi meeting the woman and the house where her husband had lived.Xi used the Guling story to tell a luncheon audience in Washington how “people to people” contacts were important for developing the relationship between the United States and China. “My friends, I believe there are many such touching stories between our two peoples,” he said. Here in China, the story seemed to put a more human face on Xi, who remains largely a blank slate for most people. “It’s like a story from Hollywood, and it’s from Xi Jinping, and he finished second half of the story,” said one weibo user called rxu Xu Ruifeng. “It shows he has some unique ways.” Chinese are more excited about basketball than politics, and the sight of Xi at the Lakers game prompted about 9,000 immediate comments on weibo—including some noting the contrast between Xi and other leaders. “Oh, quite surprised, the serious Chinese political figures are more real now,” said one user, PohuaiguijudeR. An Explanation for Xi Jinping's Disappearance?